Sawtooth Oak is a good choice for fast growing shade for your yard. 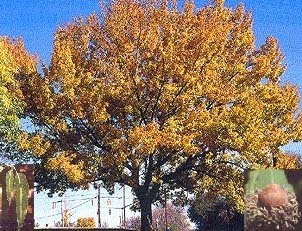 As one of the fastest growing trees, the Sawtooth Oak is an attractive shade tree with dark lustrous summer foliage and clear yellow to golden brown fall leaves. These oaks are adaptable to any soil condition and thrive in full sun. Sawtooth oaks produce acorns at a very young age, providing food for many kinds of wildlife, especially wild turkeys. Winter hardy, the sawtooth oak grows well in open, unshaded areas with well-drained, sandy loam or clay-loam soils. These trees can reach 70 feet in height with four- to eight-inch leaves. These sturdy trees are already 1-2 feet tall. Hardy in. Zones 4-9. They will be shipped bare root with moist material around their roots.